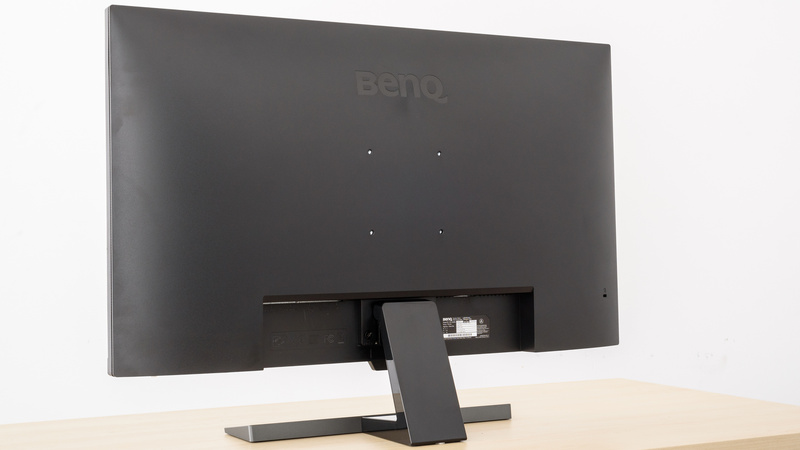 The BenQ EW3270U is a 32'' 4k LED monitor with a decent picture quality. It is more suitable for darker rooms as it cannot get very bright for a bright room, but it can display deep uniform blacks thanks to the high native contrast ratio and decent black uniformity. It has good gray uniformity and a wide color gamut, but the image deteriorates when viewed from the side. It supports HDR but unfortunately, its limited brightness prevents it from delivering the creators intent, and thus it is unlikely that you will benefit from using it in this mode. 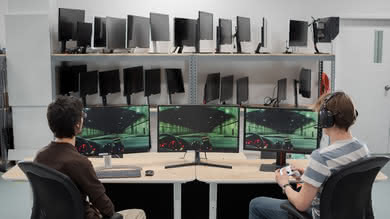 It has good motion handling and low input lag with FreeSync support to keep most gamers happy. 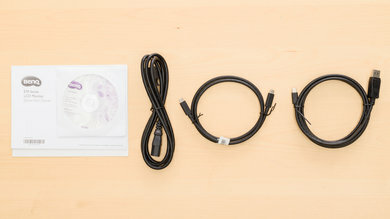 The design of the BenQ EW3270U is good. 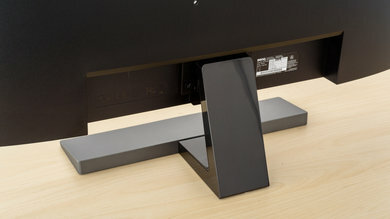 The stand supports the monitor well and it is very thin, compared to other stands in this category, allowing you to push the monitor close to the wall. Unfortunately, the ergonomics are bad and if you need to swivel or adjust the height of the monitor often, you are better off VESA mounting it. The build quality is good and will not trouble you. The stand is plastic with a matte finish, it is sturdy and provides good support to the monitor. There is only little wobbling if you accidentally nudge the monitor. Its design is flat but has a small inclination so you should avoid placing objects on it as they might slide off. The ergonomics of the EW3270U are bad. You can only tilt the monitor up and down and even that is only allowed for a very narrow range. 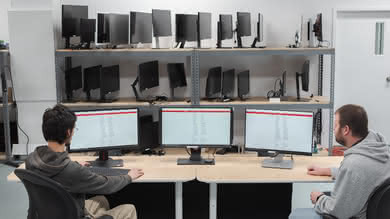 Unfortunately, you can not adjust the height of the monitor nor can you swivel left or right to show your work to a colleague. If you plan to move it often, you will be better off VESA mounting it. 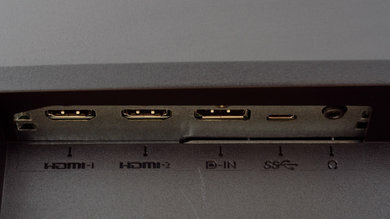 The input ports are pointing downwards and this facilitates access when VESA mounting the monitor. 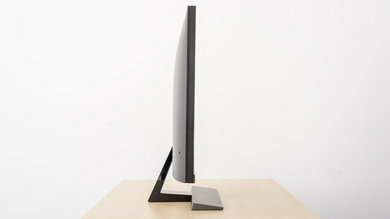 The back of the monitor is plastic with a matte finish and it is very plain. There is no cable management. The borders are thin and made out of plastic. 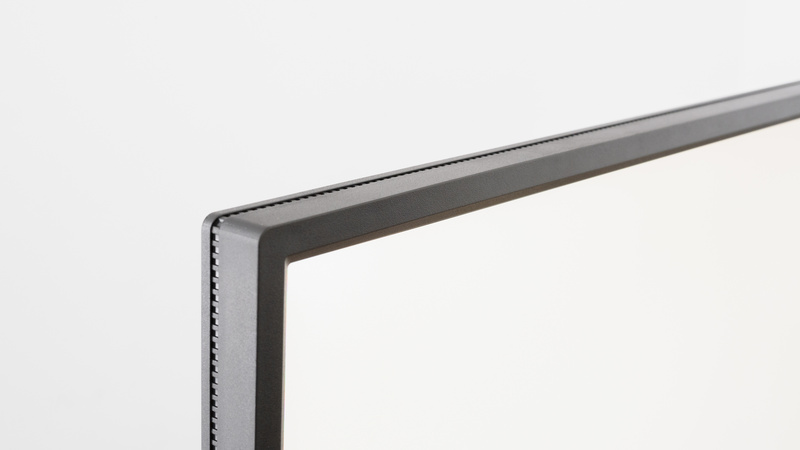 There is a groove that goes around the monitor to provide better ventilation for the monitor's electronics. 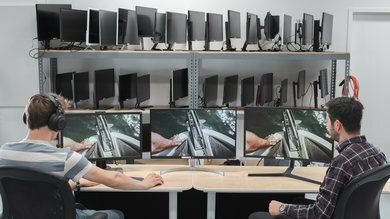 The monitor has average thickness without the stand compared to other monitors of this size. However, it is one of the thinnest ones, in its category, when measured with the stand. You can easily push it very close to the wall. The build quality is very good. 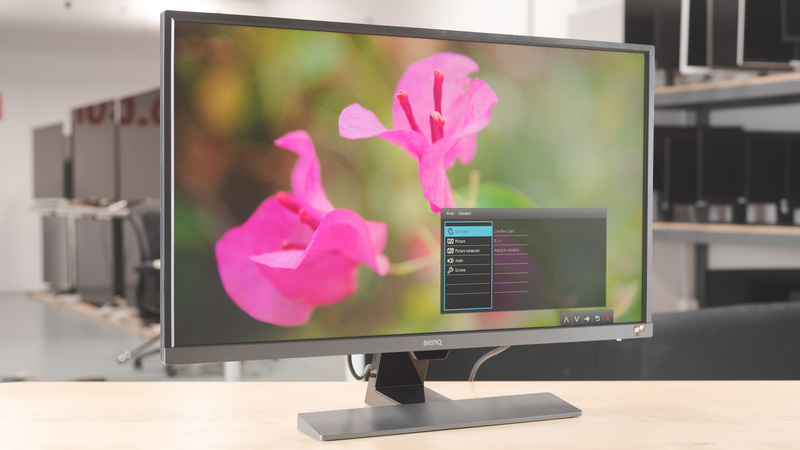 There are no gaps or loose ends in this monitor and you will have no issues with it. The BenQ EW3270U monitor has a decent picture quality. 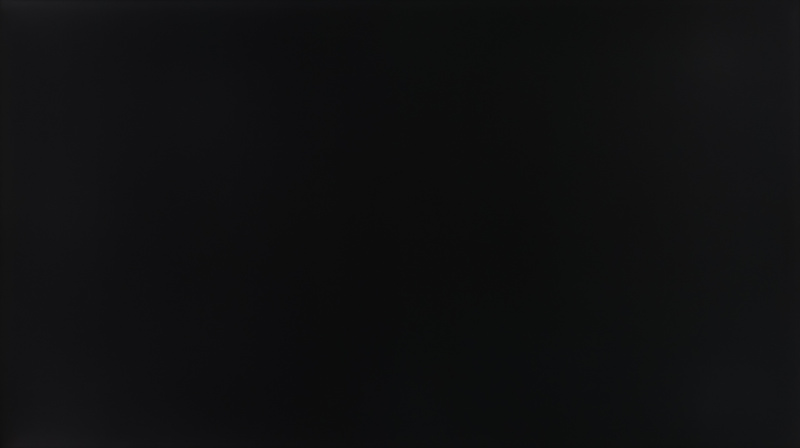 It can display deep blacks in a dark room thanks to the high native contrast ratio, and the decent black uniformity. Unfortunately, it cannot get very bright and although it supports HDR you will not benefit much from using it in that mode. The viewing angles are not good, typical of a VA panel, but it performs a bit better than most other VA-type panels. 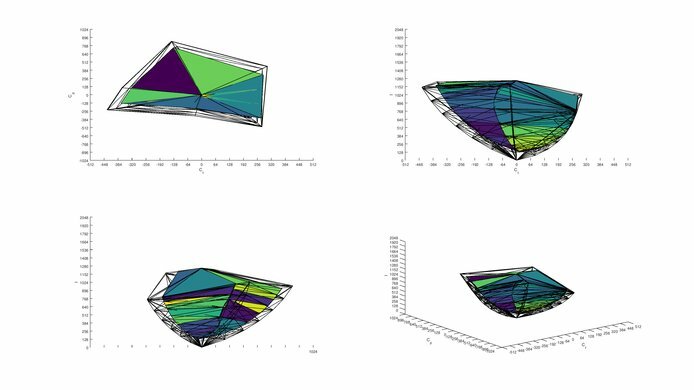 The BenQ has very good gray uniformity, and an excellent SDR color gamut although it might not be the best choice for professionals who need an even wider coverage of the Adobe RGB color space. The contrast of the BenQ EW3270U is very good. The monitor can display deep blacks in a dark room and this enhances the picture quality. The BenQ EW3270U does not support local dimming. The above video is for reference only. 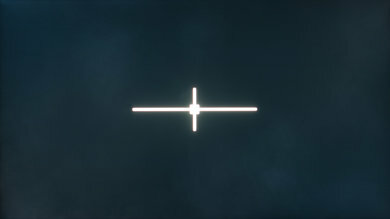 The array of LEDs is on the left side of the screen rather than the bottom where they are usually found. Decent brightness for this BenQ EW3270U monitor. 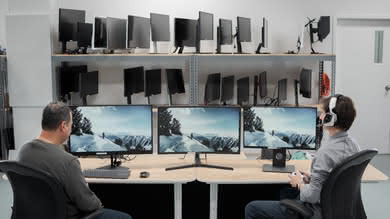 For most people, it is good enough, but if you have bright room the monitor will not be able to fight glare. The brightness remains constant across the different window sizes and this is great. Disappointing HDR peak brightness. 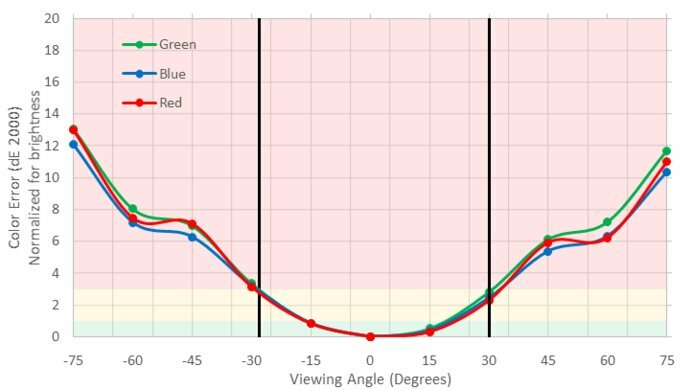 Although the monitor supports HDR content, it cannot get bright enough to deliver the creators intent. You will not benefit much from using it in this mode. 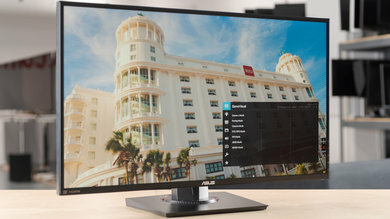 If you are looking for a better HDR monitor check out the Samsung CHG70. Disappointing horizontal viewing angles. 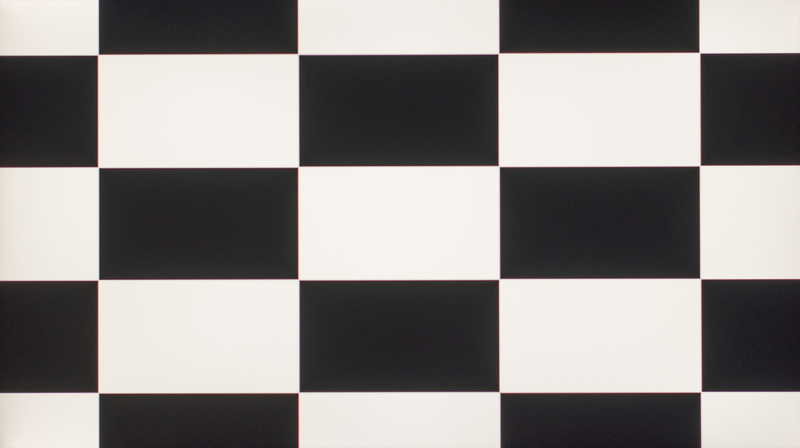 Blacks intensify quickly as you move off the center axis which results in a dimmer image. Brightness and color shifting become problematic at wider angles off center, but this cannot help avoid the diminishing of the picture quality due to the blacks. 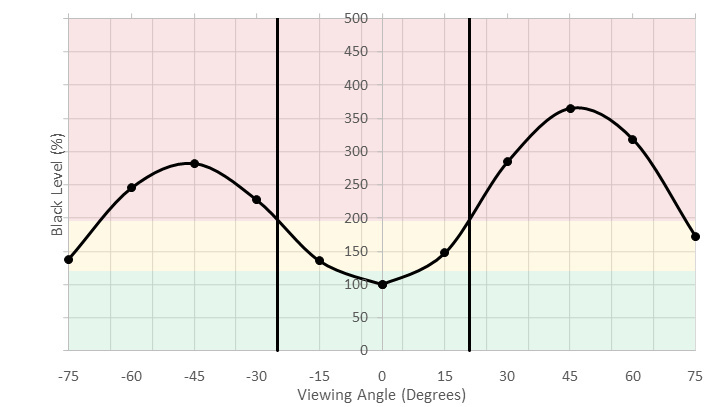 Once again the blacks' intensity is the main reason this BenQ EW3270U has just mediocre vertical viewing angles. 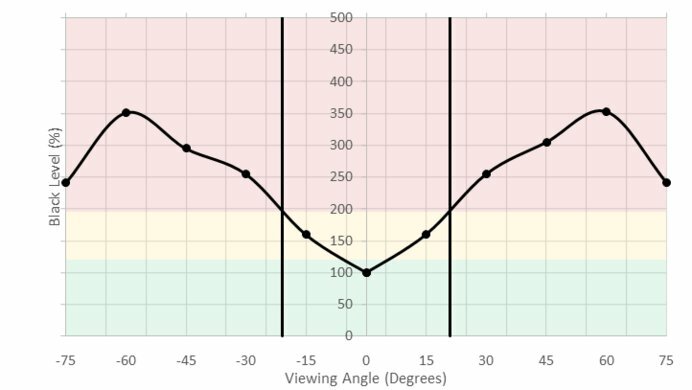 Brightness and color shifting scores are better but can not alter the overall mediocre impression this monitor leaves you with when you look at from above. Great gray uniformity for the BenQ EW3270U. A little clouding is visible scattered sound the screen and the corners are slightly darker, but it should not be a problem in normal working conditions.  The monitor has only small signs of dirty screen effect which can become more apparent when viewing a panning shot of large uniform areas. Uniformity is also very good in the darker scenes as can be depicted from our 5% gray test picture. There is almost no visible clouding with the exception of the edges that look slightly brighter.  Similar issues are also depicted in the black uniformity picture and are likely linked to backlight bleed. 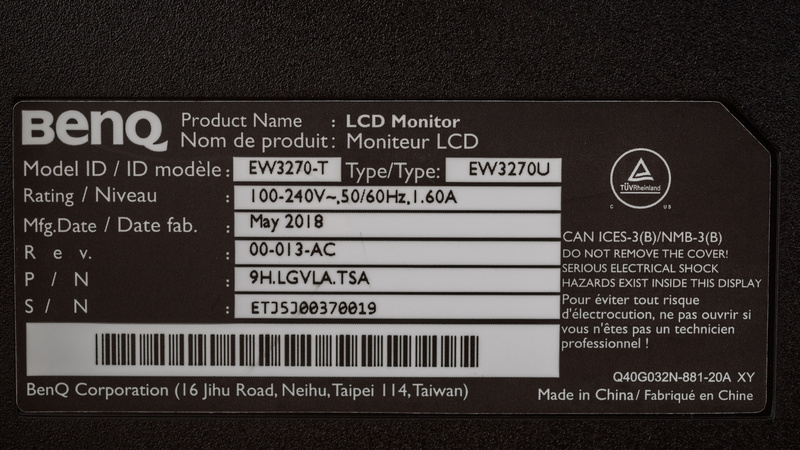 The performance of this monitor is very similar to that of the LG 32UD59-B. Decent black uniformity for the BenQ EW3270U. There is some backlight bleed visible almost everywhere but especially around the edges and close to the corners. 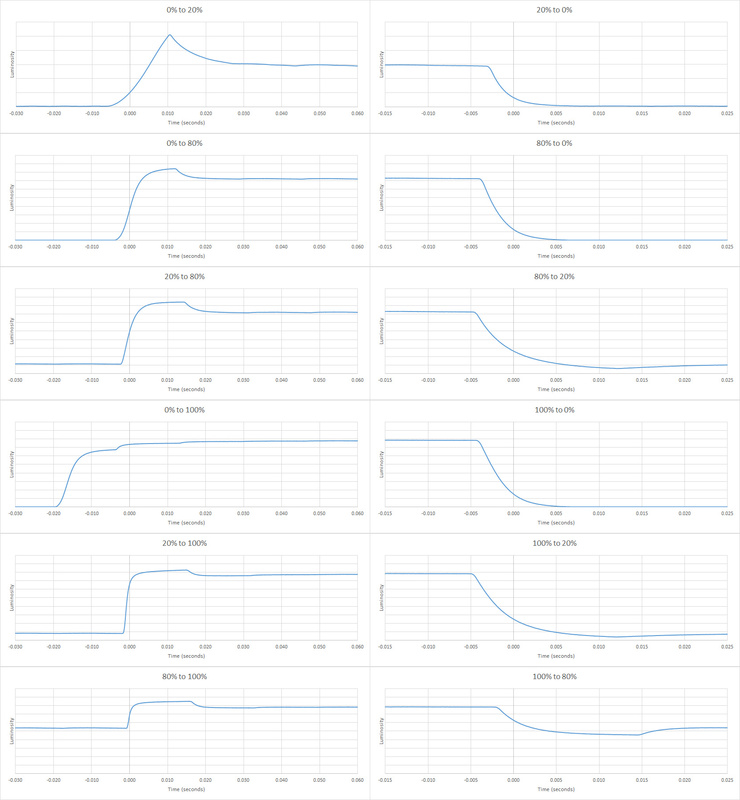 This is, however, the second-best score we have measured up to date along with the LG 32GK850G, and only the LG 32UD59-B was able to score marginally better. Out of the box, the accuracy is good. The most accurate picture mode was the 'sRGB' one. 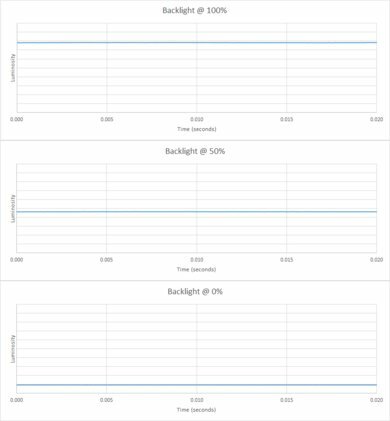 With luminance set to 100 and contrast to 50, the white balance dE is above the 3.0 mark and we expect most people to notice some gray inaccuracies. The color dE is below 3 and thus the color inaccuracies are harder to spot. 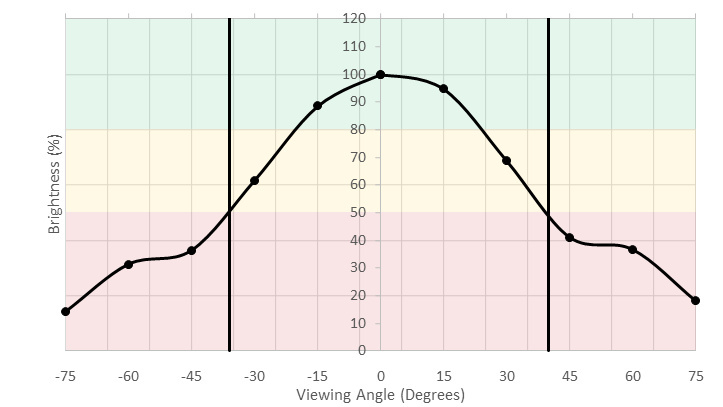 The color temperature is on the warm side and the monitor has a red-yellowish tint. 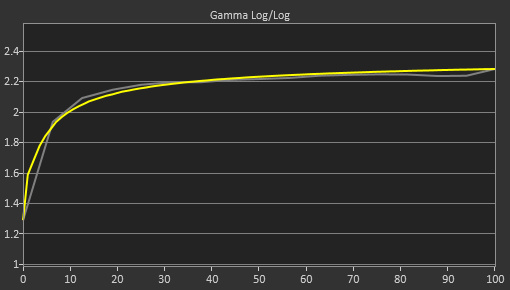 Finally, the gamma is very close to the average dE of 2.2 target and follows the target curve very closely. After calibration the color accuracy on this EW3270U BenQ monitor is remarkable. 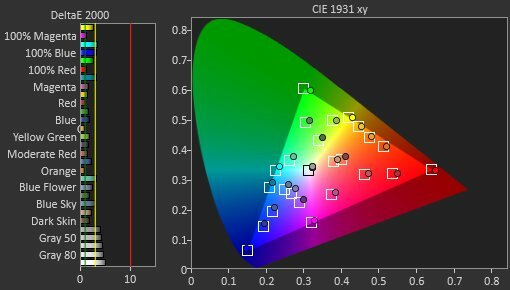 White balance dE and color dE are lowered to values that are impossible to spot any inaccuracies without a colorimeter. The color temperature is corrected and now is very close to the 6500K target and the gamma has an average of 2.2, following the sRGB target closely. We performed our calibration in the 'User' picture mode. Excellent SDR color gamut. 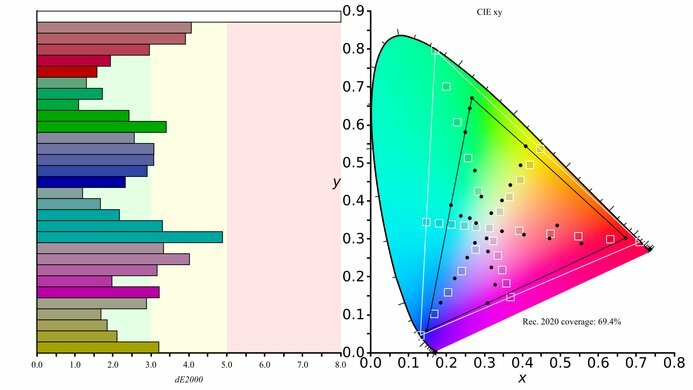 Nearly perfect coverage of the s.RGB color space. 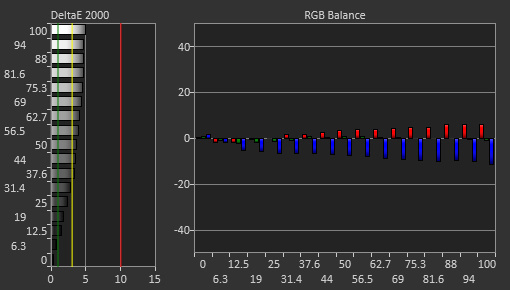 This monitor ranks second in terms of Adobe RGB coverage from the ones we have tested so far. 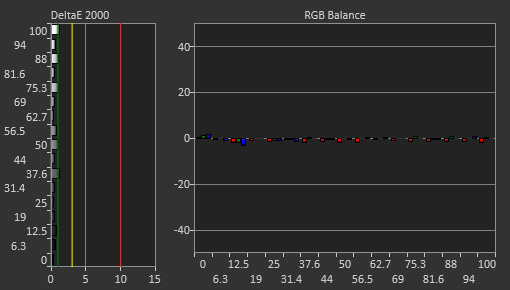 However, it might still not be enough for those professionals who work in the wider Adobe RGB gamut. 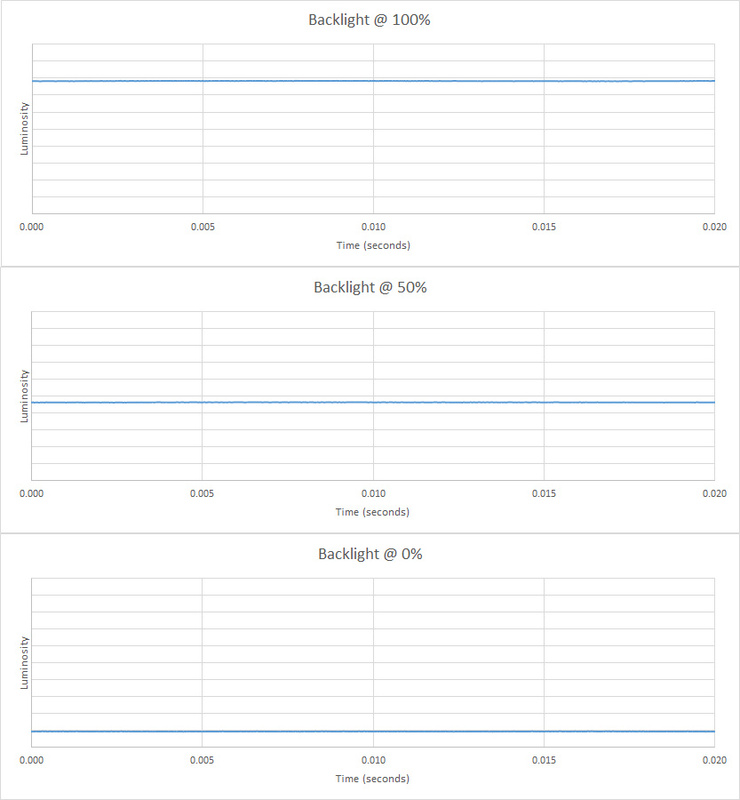 Perfect coverage of the sRGB in ICtCp color volume. 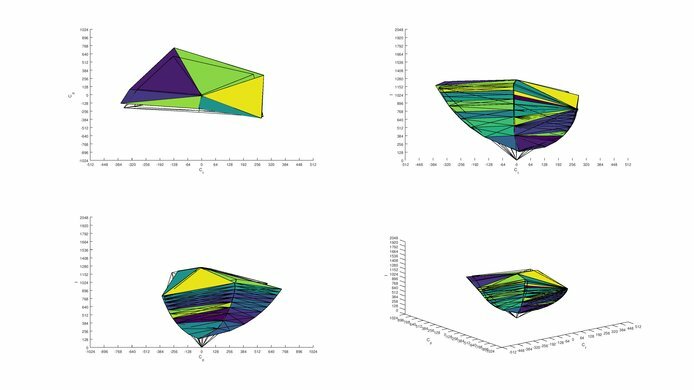 The only difficulties this monitor faces, are in producing saturated greens and rich colors in the dark shades. 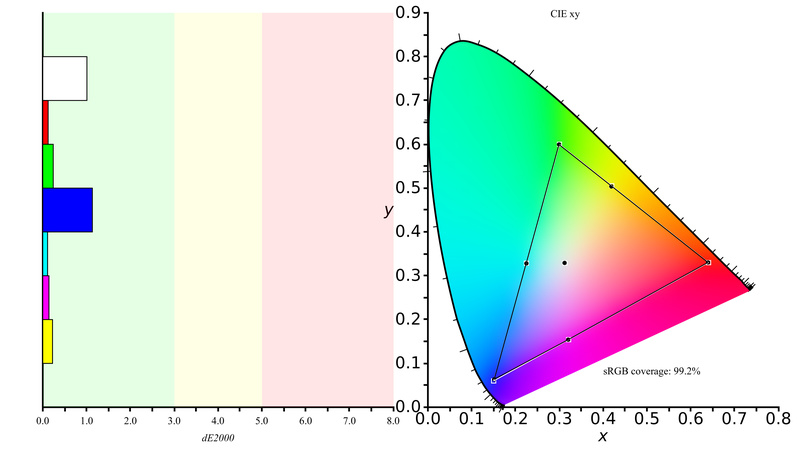 Good HDR color gamut for the EW3270U monitor. 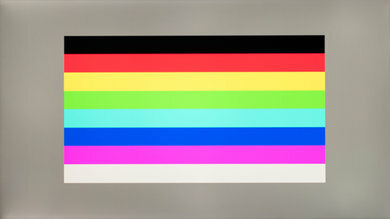 The monitor covers a very good part of the DCI-P3 color space which is used in most movies made today. However, when it comes to the wider Rec.2020 the coverage is only decent but still better than most monitors that are out there today. The result is very similar to LG32UD99. Decent HDR color volume. 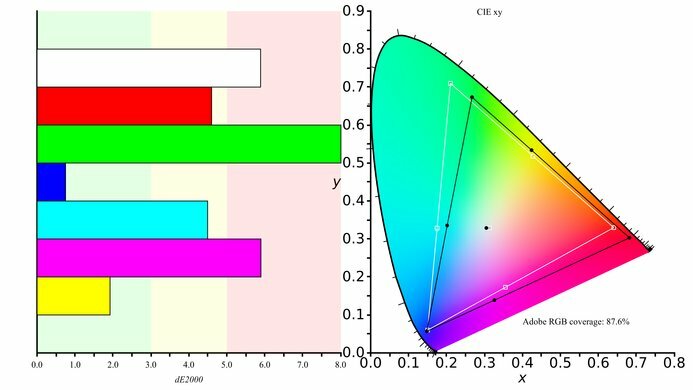 The color volume is limited by the narrow color gamut. 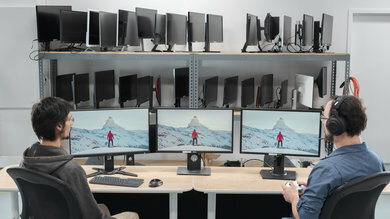 Excellent performance of the BenQ EW3270U in our image retention test, as no retention could be noticed even right after the bright 10 minutes static scene. 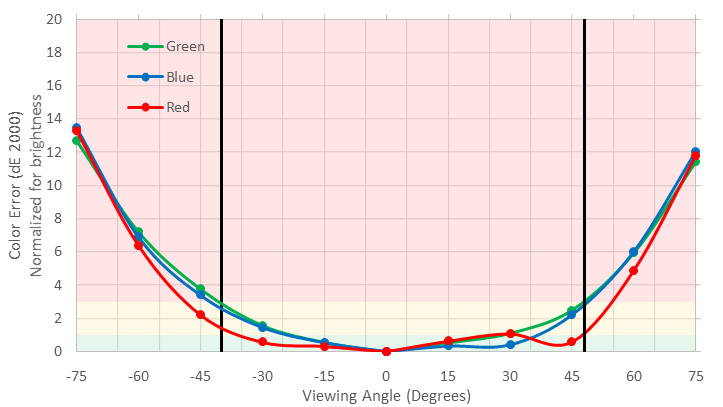 The BenQ EW3270U has excellent gradient performance. You can hardly spot any banding with the naked eye. 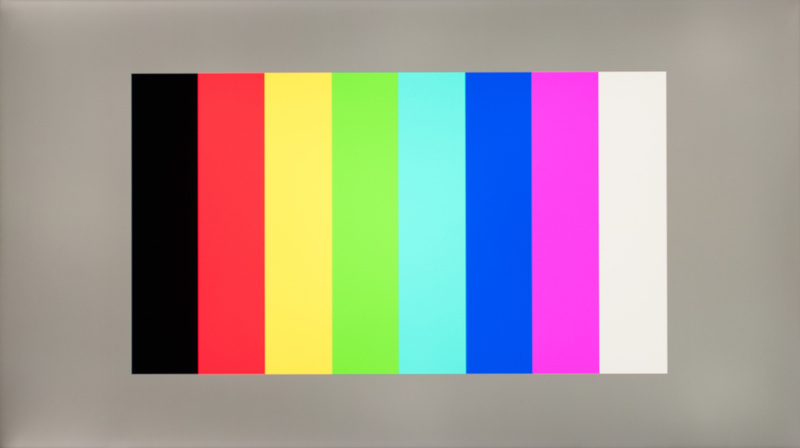 Perfect color control for the BenQ EW3270U, as there are no pixel errors. The handling of reflections on the BenQ EW3270U is good. Reflections are diffused across the screen by the semi-gloss finish and this reduces their intensity. 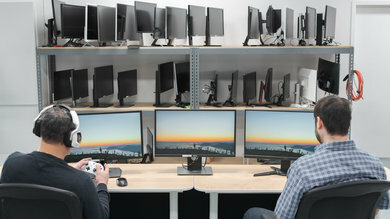 The monitor has no issues with reflections except when in a very bright room. 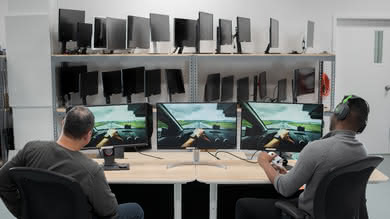 Very good motion handling for the BenQ EW3270U with a fast pixel response time, a flicker-free backlight, and support for FreeSync variable refresh rate. 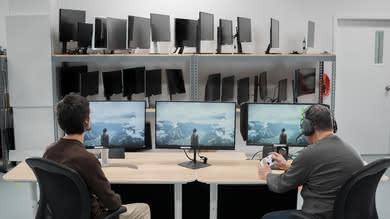 Unfortunately, the 60 Hz native refresh rate and the narrow FreeSync range are not an attraction to competitive gamers. 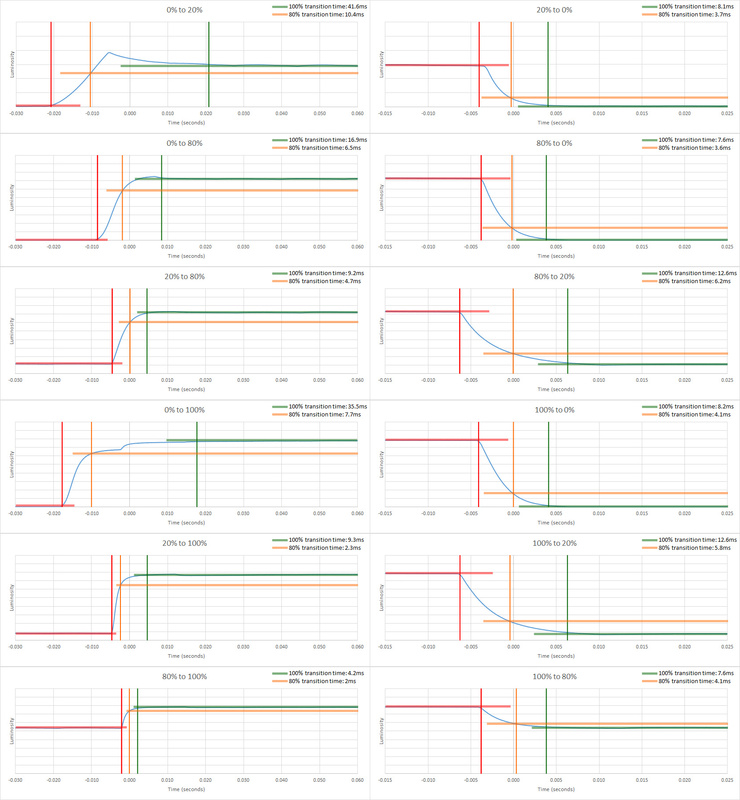 Fast pixel response time. Fast-moving content has only a small blur trail. 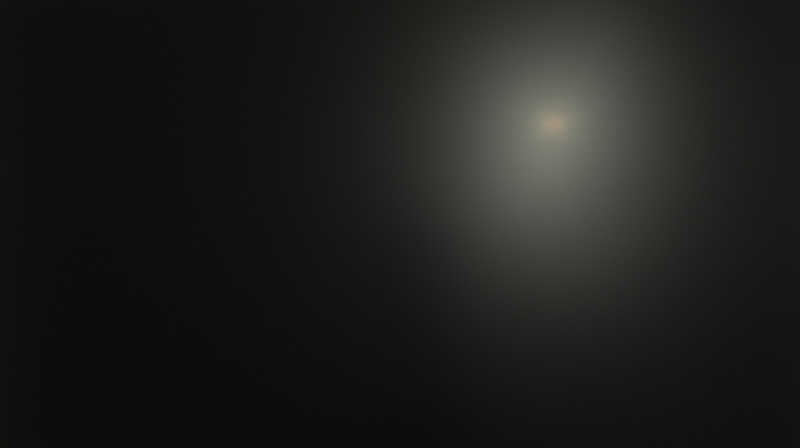 Most of the blur in the photo is due to 60 fps persistence; only a faint ghosting/smearing trail can be seen following the logo, which is great. We prefer not to use any of the overdrive settings and leave the 'AMA off' since the other two options add noticeable overshoot. The BenQ EW3270U is flicker-free, as it does not use PWM to dim the backlight. Unfortunately, it does not have an option to introduce flicker to make motion look crisper, but it is common for 60Hz monitors to lack this. The EW3270U supports the FreeSync implementation of the variable refresh rate technology. Unfortunately, the VRR range is limited and this might disappoint a few gamers. 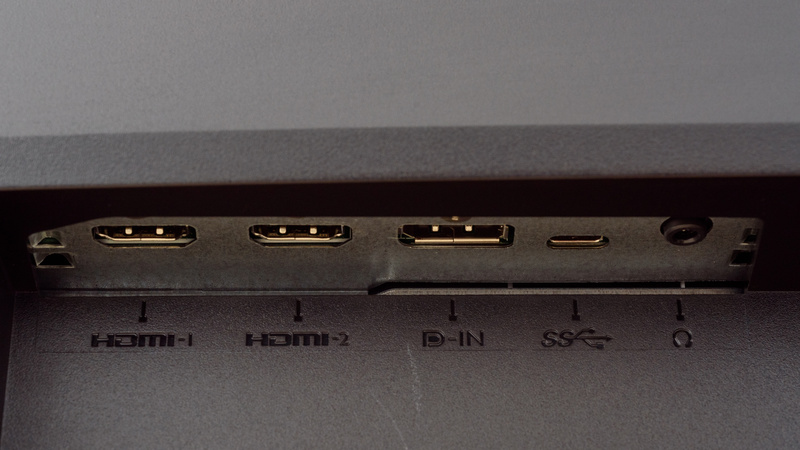 The good news is that FreeSync is supported on both DisplayPort and HDMI ports, which also give the same test results. Update 01/15/2019: We have tested the EW3270U with NVIDIA's new FreeSync driver, and it worked perfectly over DisplayPort. 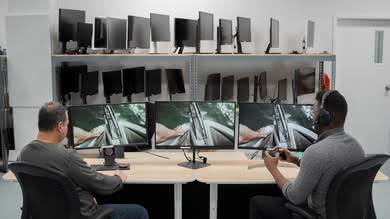 There were no noticeable issues during our testing, and the full FreeSync range was tear-free. The BenQ EW3270U has a low input lag that will please most people except the most competitive gamers. It has a very large 32'' screen with a 4k resolution so you can easily multitask and see more details of your work on your screen. Excellent low input lag on the BenQ EW3270U, good enough for all but the most competitive gamers. 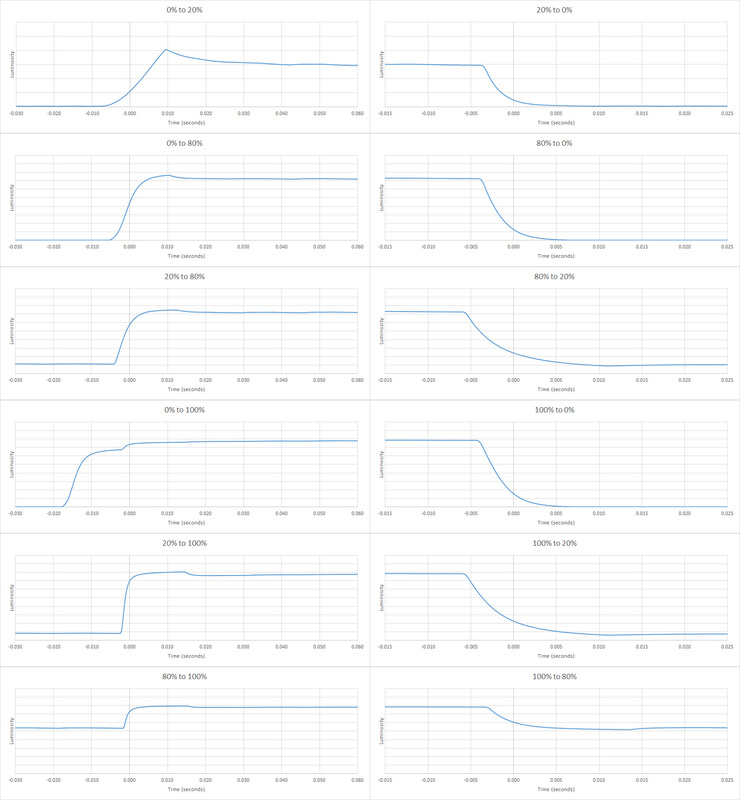 The input lag is just slightly better than the LG 32UD59-B and other 60 Hz monitors like the Dell U2715H. 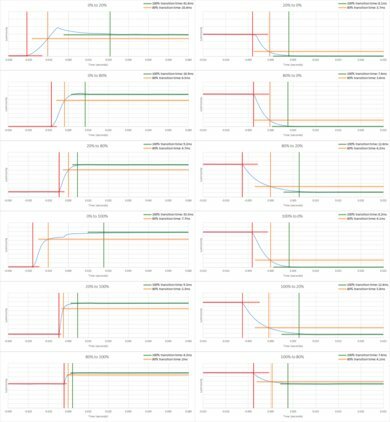 144 Hz monitors have lower input lag due to their faster panel. 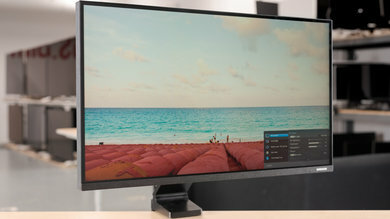 The Samsung CHG70 is one such monitor. 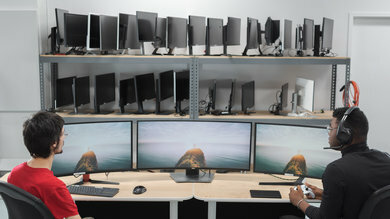 The monitor has a 4k 32'' screen. The large screen size and the very high resolution allow you to see more details of your work and this is great, especially if multitasking is a big part of your work. All inputs are facing downwards. The BenQ EW3270U has internal speakers, supports HDR10, and a feature called 'Eye Care', which aims at protecting your vision. The On-Screen Display is intuitive and easy to use. 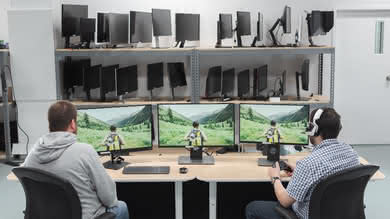 The monitor has a feature called 'Eye Care' that encompasses the 'Low Blue Light' and 'Brightness Intelligence Plus (B.I.+)' technologies that aim to make working on a monitor in dimmer environments less tiring for the eyes, while at the same time preserving the image quality. Also, just below the brand label on the lower screen bezel, there is a light sensor that controls the auto brightness of the monitor. There is an HDR/BI button on the lower right side of the screen. 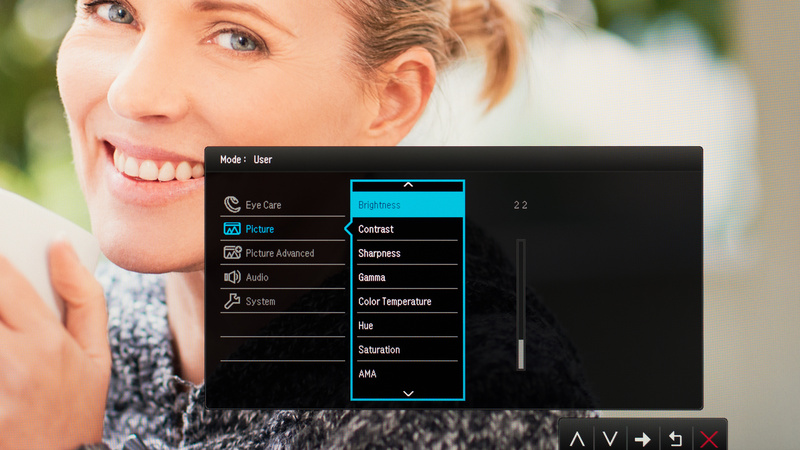 When the monitor is in HDR mode the button only toggles the B.I.+ function on and off. However, when not in HDR mode, the button turns on "simulated HDR" and toggles the B.I.+ on and off. We tested the BenQ EW3270U. The EL2870U is a TN-type panel monitor of the same line, but until we test it, we can not be sure if the performance is similar. If someone comes across a different type of panel or if their BenQ EW3270U doesn't correspond to our review, let us know and we will update the review. Note that some tests such as the gray uniformity may vary between individual units. The EW3270U we reviewed was manufactured in May 2018. 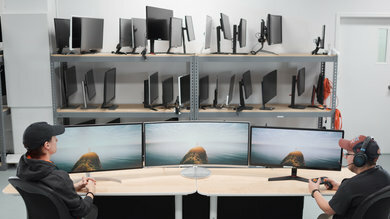 Left: LG 27UK650-W. Middle: BenQ EW3270U. 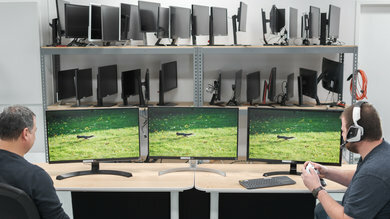 Right: LG 27UD68-P. This is a good monitor that unfortunately loses many points due to its bad ergonomics. See our recommendations for the best 28-32 inch monitors, the best 4k gaming monitors, and the best large monitors. The BenQ EW3270U is better than the BenQ EL2870U. The EW3270U has a much better native contrast ratio, and better black uniformity. 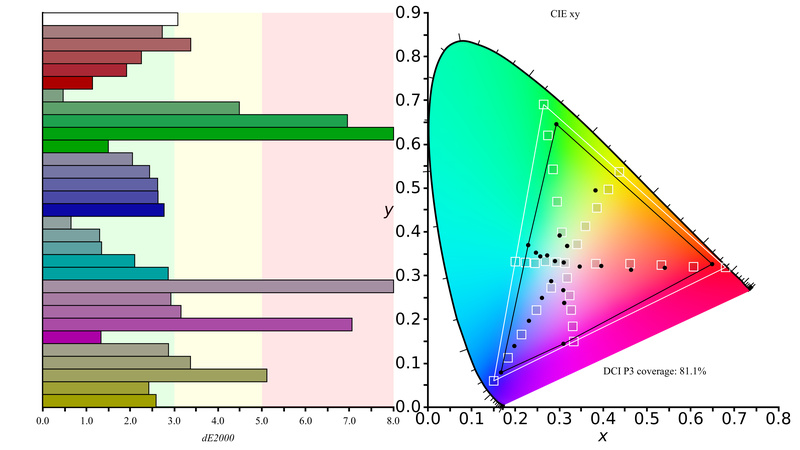 The EW3270U also has better HDR performance, as it can display a wide color gamut. The BenQ EW3270U is better than the Samsung UJ590. 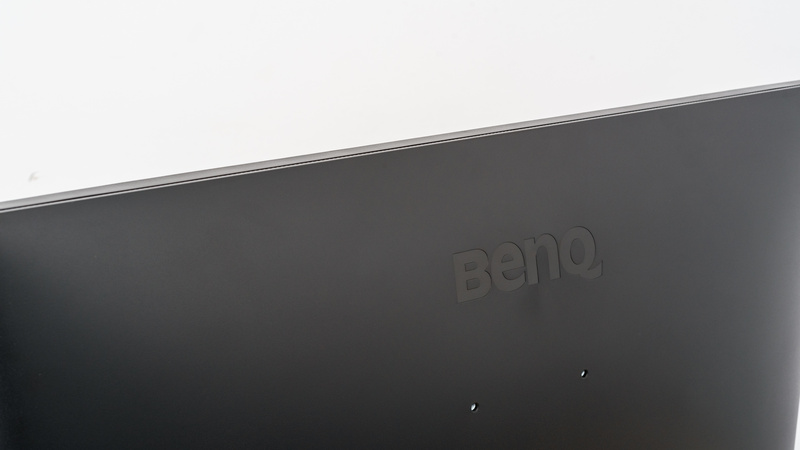 The BenQ supports HDR, and the backlight is completely flicker-free. The BenQ EW3270U is also much brighter than the Samsung UJ590, and it has two full bandwidth HDMI 2.0 ports that can display 4k @ 60Hz. 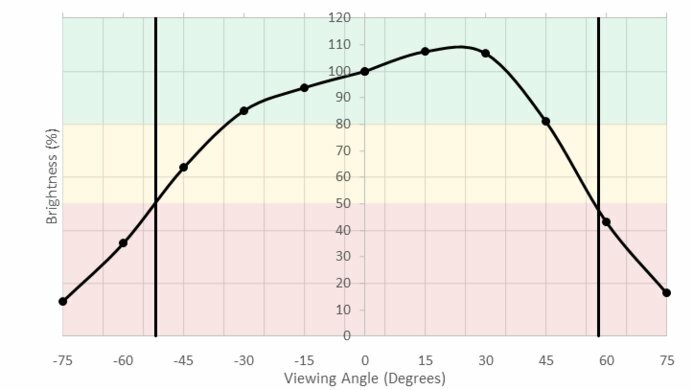 The Samsung CHG70 is better than the BenQ EW3270U. 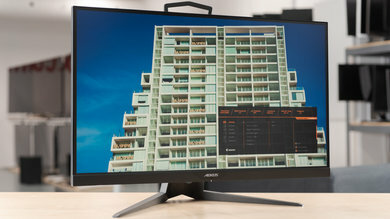 The Samsung CHG70 has much better ergonomics and local dimming support to enhance picture quality and can get brighter in HDR. The CHG70 also has a faster pixel response time, lower input lag, and faster refresh rate, all of which are great news for gamers. The BenQ EW3270U is larger with better resolution and marginally better black uniformity. The Dell U3219Q is better than the BenQ EW3270U for most people. If you care more about dark scene performance, then the BenQ EW3270U is a better choice as it has better contrast and better black uniformity. 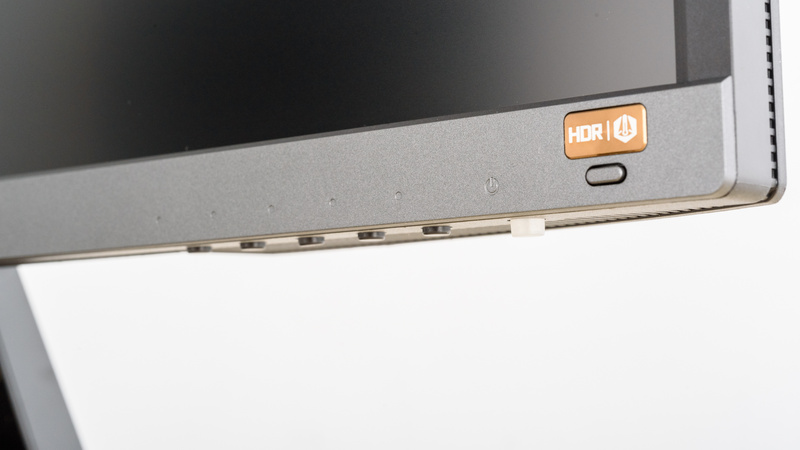 The BenQ EW3270U is also flicker-free. 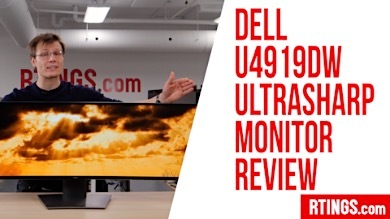 On the other hand, the Dell U3219Q has much better ergonomics, so you can place it comfortably and much better viewing angles so that the image remains accurate when you view it from the side. The BenQ EW3270U is significantly better than the Samsung CF791. 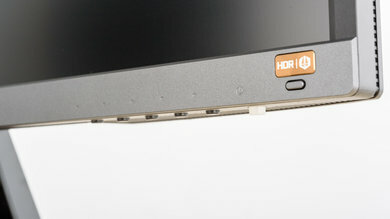 The BenQ EW3270U has better resolution, can display more detail on its screen, and supports HDR content. The EW3270U also has lower input lag and more uniform blacks. The Samsung, on the other hand, has a slightly faster pixel response time that leaves a smaller motion blur, and much better ergonomics to help you position it to your liking. This is a decent monitor for mixed usage. It is more suitable for dimmer environments as it cannot get very bright, but can display deep uniform blacks. 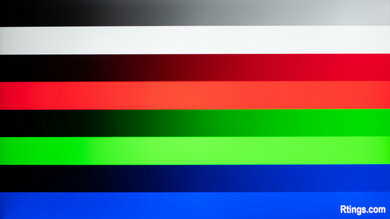 The monitor supports HDR, but because of the poor brightness, you will not benefit using it in this mode. Its large screen size and 4k resolution allow you to see a great deal of detail when you are working or gaming with this monitor. 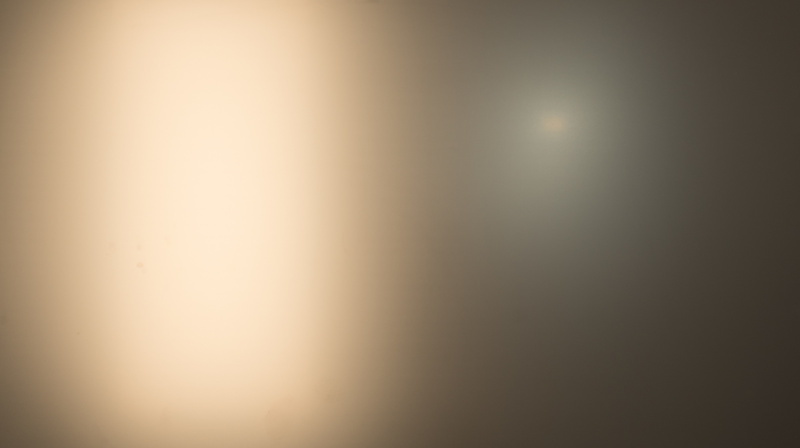 It can handle reflections well so you should not worry about placing it in a room with many small light sources. Unfortunately, the bad ergonomics can make it hard to find a comfortable position. 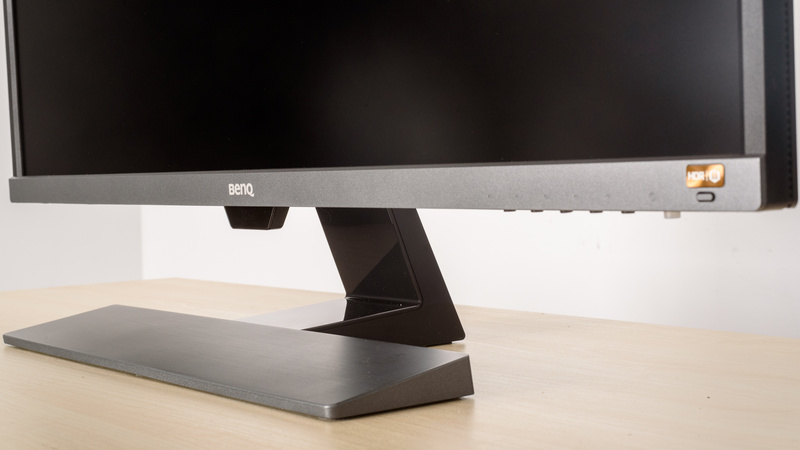 The BenQ EW3270U is a decent monitor for office use. It has an excellent 4k resolution and a large 32-inch screen size which allows you to see every little detail of your work. 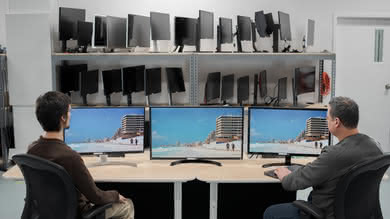 If you wish to share your work with a colleague, the poor viewing angles will not allow them to enjoy the same picture quality without swiveling the monitor to face them directly. Unfortunately, the bad ergonomics cannot help either, so if you regularly work in teams then you might want to VESA mount it. The BenQ EW3270U is a good monitor for playing games. It has a low input lag and supports FreeSync which will make those with Xbox One S/X or NVIDIA graphics cards happy. 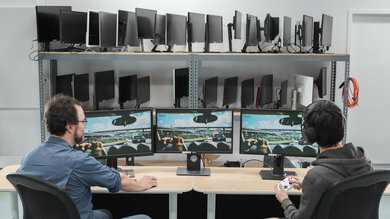 It is fairly large and has an excellent 4k resolution that can display every little detail of your game. It has an ordinary 60Hz refresh rate and a fast pixel response time which only leaves a small blur trail in fast-action scenes. 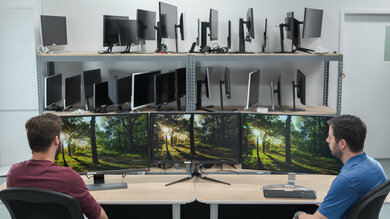 Unfortunately, the ergonomics will not make it an easy task to position the monitor to your liking. The BenQ EW3270U is a good monitor for multimedia usage. It has a large screen with ample 4k resolution that is capable of displaying 4k content without downscaling. It has a low input lag and thus it is very responsive to your actions. Unfortunately, when you view it from the side the picture quality deteriorates. It has good reflection handling but you will have a hard time placing it in a comfortable position since the ergonomics are bad. The BenQ EW3270U is a decent monitor for media creation. It is a large monitor with a great 4k resolution which makes it comfortable for professionals to work on. However, the ergonomics are bad and it might be a good idea to VESA mount it for better flexibility and at the same time to resolve the issue of poor viewing angles. 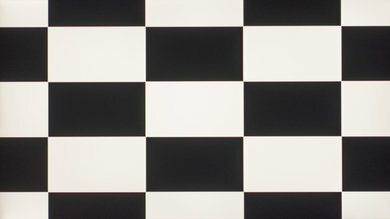 It has good gray uniformity and excellent coverage of the DCI-P3 color space. 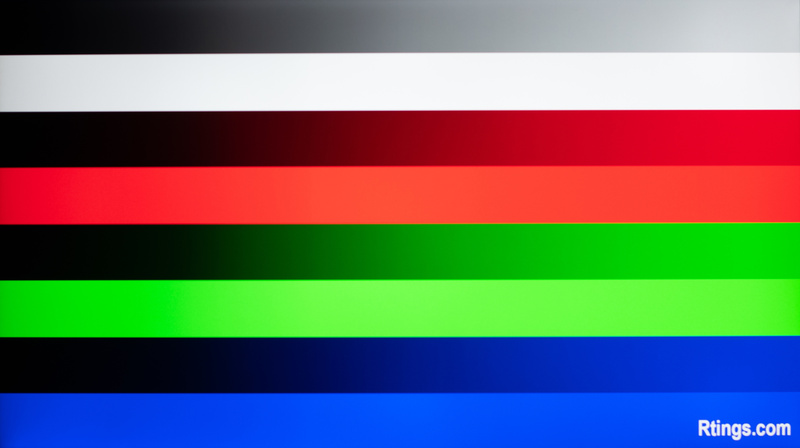 Unfortunately, the coverage of the Adobe RBG color space might not be enough for professionals in the publishing or printing industries. This monitor is decent for HDR gaming. It has a high native contrast ratio and decent black uniformity so it can display deep blacks in a dark room, but lacks a local dimming feature to further improve performance. It also has a low input lag which makes it very responsive to your actions. Unfortunately, the monitor cannot get very bright in HDR and its performance is far from the creators intent. It has good size and resolution, but very poor ergonomics.